DoPDF Free PDF Converter is a software to create PDF document . It is designed for a personal or professional use. The application is compatible with any software which has a print function (Microsoft Excel, Powerpoint Microsoft, Microsoft Word, WordPad, NotePad, etc.). With a single click, the user can convert his documents. Completely free, this software includes 20 languages and allows to customize the resolution of the documents (from 72 to 2400 dpi). It offers more features that are detailed below. PDF converter: doPDF is a free software that allows you to convert PDF file. By setting up as a virtual printer in the computer system, it can convert any printable document (DOC, XLS, PPT, PUB, DOCX, XLSX, PPTX, PUBX, HTML, TXT, ...) into PDF. Easy to use: as doPDF installs itself as a virtual printer, so it can be added to printers and fax machines' list. Thus, when printing, instead of choosing your default printer, you just have to start the conversion and send the PDF file to the destination folder. Autonomous: doPDF is a fully standalone, meaning that it does not require using a third-party program such as ghostscript or Framework.NET. Multilingual: doPDF's interface is available in 33 different languages . It is not only fast but uses little CPU. To top it all, it is a free PDF converter available for personal or business use. 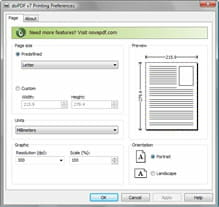 doPDF is available for free and easy to use. It offers a plain and intuitive interface. Latest update on March 3, 2015 at 10:41 AM.